Key to the Orphanage, birthplace of the Choir. The Orphanage, shadowed by the Grand Cathedral, was a place of scholarship and experimentation, where young orphans became potent unseen thinkers for the Healing Church. The Choir, that would later split the Healing Church, was a creation of the Orphanage. 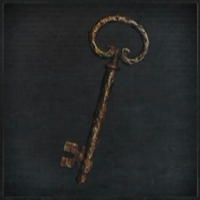 Orphanage Key is a Key Item in Bloodborne. The Orphanage is behind the big door in the grand hall, guarded by 4 Wolf Beasts and 2 more Brainsuckers in Upper Cathedral Ward. Dropped by a Brainsucker in Upper Cathedral Ward, next to where the Wolf Beast jumps through the window. It's possible to attain the Orphanage Key through the locked door next to the window by attacking the Brainsucker using a weapon with long reach, such as the Holy Blade.